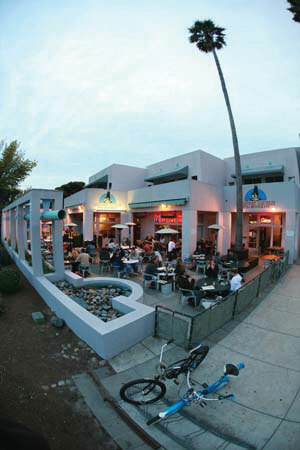 Say the word “Santa Cruz” and most people think of surfing, mountain biking, or good times at the beach. Now Santa Cruz is getting a reputation for great beer as well, thanks to a small but lively brewing community. Santa Cruz County had a couple of California’s earliest craft breweries when Seabright Brewery opened in 1988, and Boulder Creek Brewery opened up a year later. Then after a relatively quiet period of fifteen years, new breweries started popping up every couple of years. In many cases the seeds of each new brewery were planted by the breweries that came before it. 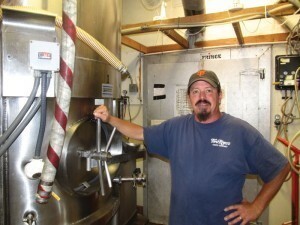 Seabright Brewery brewmaster Jason Chavez. Share a pint with Seabright brewmaster Jason Chavez and he’ll gladly tell plenty of stories on how the Santa Cruz brewing scene came to be. 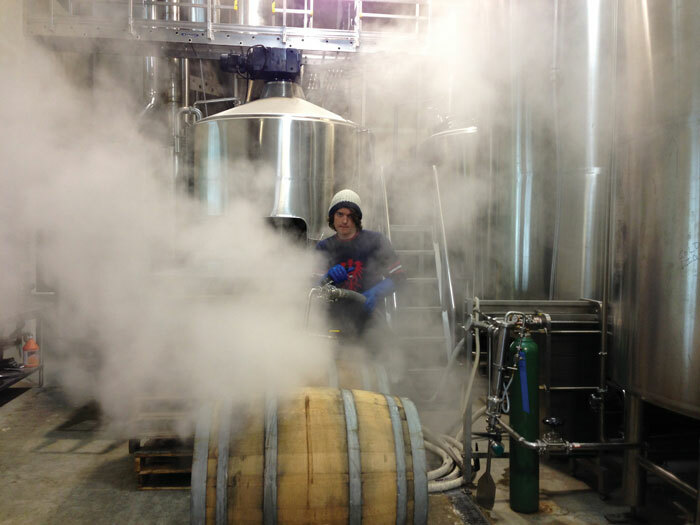 Jason started brewing at the tender age of 17 when he first tried his hand at home brewing. And what did his mom tell him when she discovered him brewing beer well below the legal drinking age? “She just told me to make sure to clean up after myself,” he recounts. After completing the American Brewer’s Guild program in 1997, Chavez started as an assistant brewer in 1999 under Marc Rosenbloom at Seabright Brewing until Rosenbloom left to start Santa Cruz Ale Works about six years ago. “We’re all friends here,” says Chavez of the region’s seven breweries. “One day, Tim Clifford (co-owner of Sante Adairius Rustic Ales) shows up at my door with a bag of malt and tells me his mill is down.” Without hesitation, Chavez let Clifford use his mill until he could get his fixed. And of course, when Chavez needed a compressor for his canning line, he borrowed one from nearby Uncommon Brewers. 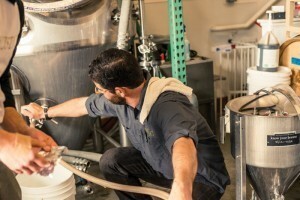 Santa Cruz brewers are constantly loaning each other equipment and bags of malt or hops the way next door neighbors swap power tools or borrow cups of sugar. Detail of the craftsmanship at Santa Cruz Mountain Brewing. A similar collaboration ocurred when Rob and Kathleen Genco approached Santa Cruz Mountain Brewing co-owners Emily Thomas and Chad Brill last year while planning to open a brewery of their own, Soquel’s 100% organic Discretion Brewery. Since 2005 Santa Cruz Mountain Brewery enjoyed their position as the only organic brewery in the area, yet without hesitation they provided the Gencos with invaluable support and insights in running an organic brewery. 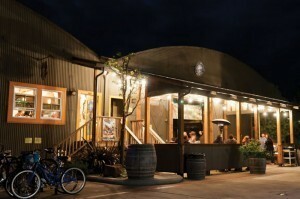 Like most Santa Cruz breweries, Discretion started with few resources. “It’s an exciting process building virtually everything from scratch,” is how Discretion brew master Michael Demers describes it. While Discretion currently sells beer only at its tap room, that will change soon as it expands into a 3,000 square foot space next door. 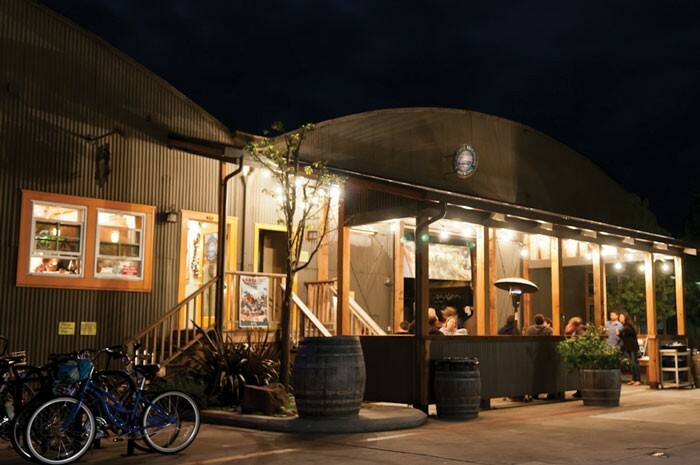 While Discretion hatches its expansion plans, they continue to recommend tap room visitors to check out Sante Adairius Rustic Ales in nearby Capitola, which was opened last year by owners Tim Clifford and Adair Paterno. It didn’t take long for Sante Adairius’s distinctive beers, often barrel aged and brewed with specialty yeast strains, to generate considerable buzz throughout Northern California’s beer geek community. Stopping by the Sante Adairius tasting room one late summer afternoon, I noted that a crowd was overflowing out of the tap room and into the parking lot. Santa Cruz Mountain Brewing’s unique taproom. The tall, bearded Clifford looks somewhat professorial with his thick black glasses as he quickly works through the crowd. Perhaps that’s because Clifford was on his way to becoming a professor before finding a new calling. “I was in the Ph.D. program in the History Department at UC-Santa Cruz, but decided I wanted to work with my hands instead of my head,” explained Clifford. Before moving on to another table, he quickly added, “This brewery better work because I don’t want to do anything else.” Considering his beers are notorious for selling out quickly, it’s unlikely he’ll have that problem. 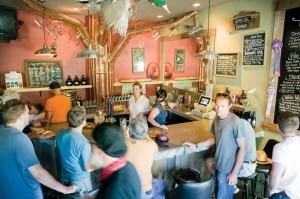 What fuels the varied, eclectic brewing scene in Santa Cruz County? Most likely it is the region’s culinary tradition, its emphasis on small local businesses, and a rich home brewing culture. I also think Santa Cruz’s burgeoning adventure sports culture has played a major role. Generally speaking the region’s beers are more on the “sessionable” side of the beer spectrum relative to the rest of Northern California. That means less alcohol than other more extreme craft beers (think Pliny the Elder), a better choice after a day spent on your bike or in the ocean. It’s worth noting that many cyclists end their rides at Santa Cruz Mountain Brewing or Seabright Brewery, and as Discretion’s Mike Demers notes, “a lot of people with kayaks on top of their cars stop by our place.” Brewing is an expensive business to get started in, and you have to think Santa Cruz’s burgeoning outdoor culture has contributed to the success of its beer culture through simple economics. 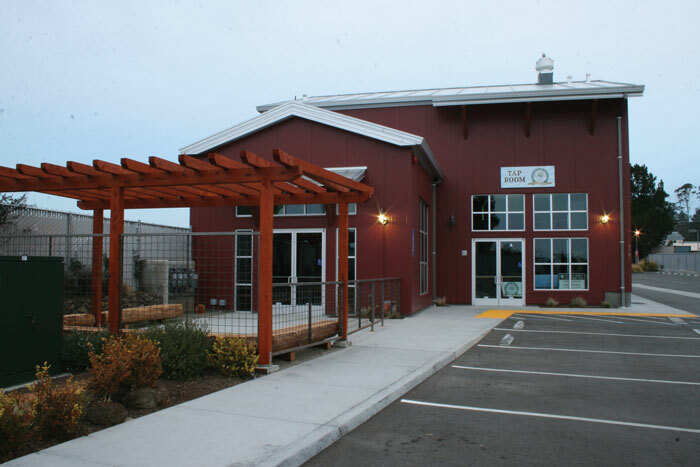 Discretion Brewing, a sustainable brewery based in Soquel, opened it’s doors in March. 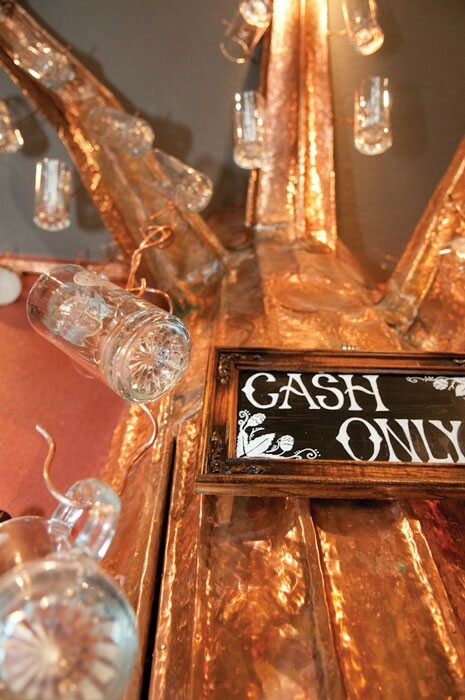 > Amenities: Tap room, sandwiches, snacks and appetizers. > Recommendations: I really appreciate the restrained complexity of all of Discretion’s beers, but if I had to pick one after a day outdoors, it would be the Third Conversation Amber Saison. It’s brewed with orange peel, coriander, toasted malt and saison yeast to create a lively and distinctive beer. > Amenities: Tap room, sandwiches and snacks. > Recommendations: Santa Cruz Ale Works sticks to traditional English and German styles. My favorite is their Kolsch, with a light lemon note and refreshing mineral-like finish. Their rich and smooth Dark Knight Oatmeal Stout is a close second. Close to Wilder Ranch, Santa Cruz Mountain Brewing is a popular post-ride hangout. > Amenities: Tap room and snacks. Sandwiches can be ordered from Kelly’s French Bakery nearby. > Recommendations: I’ve long been a fan of their People’s Porter, a roasty, smoky porter amped up with organic cold-filtered coffee and a hint of vanilla for good measure. They usually have some funky, off-beat special release on tap (i.e., a Lavender IPA) that are quite good. Sante Adairius makes the extremely popular 831 IPA. > Recommendations: You never quite know what to expect since Sante Adairius is constantly experimenting with new beers that sell out quickly. It’s hard to go wrong with any of their selections. 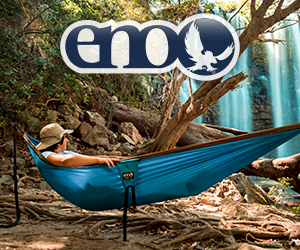 Their 831 IPA is a dry, balanced brew with a musty, herbaceous character unlike any IPA you’ve ever had. The wide open patio at Seabright Brewery. > Amenities: Full service restaurant, bar. > Recommendatios: Blur IPA is easily Seabright’s most popular beer and for good reason. It’s a dry, well balanced IPA with citrus and a lightly floral hop flavors. The Oatmeal Stout is smooth, slightly sweet and a little chocolaty and has won five, count ‘em, five Great American Beer Festival medals. > Amenities: Uncommon Brewers does not have a tap room. Visitors are by appointment only. Hard work at Uncommon Brewers. of uncommon ingredients like bacon in their Bacon Brown Ale, or Thai spices in their Siamese Twin Belgian Double Ale. My favorite Uncommon brew is their more conventional Golden State Ale, a Belgian Golden Ale made with toasted poppy seeds. Park on Highland Way and coast downhill thru Demo Forest and Nisene Marks to Sante Adairius for some “rehydration”. Work it off by slogging back uphill to the car.